So how should an energy realist go about reminding a University of Toronto Presidential Advisory Committee that the “good old days” were more akin to trying times, that poverty is something that most human beings have historically tried to escape from rather than a virtue, and that (energy) reality is not optional? One option is to explain once more that coal, petroleum and natural gas came to dominate our energy system for good practical reasons, and that truly superior alternatives would not need taxpayers’ money to be mandated into our houses or shoveled down on our landscape. For instance, a few days ago my friends Germain Belzile and Youri Chassin published a study on the costs of an accelerated transition toward green energies and the willingness of Canadians to pay for these costs. Looking at some proposals of Québec-based Équiterre and Vivre en ville for reducing oil consumption for personal transportation that ranged from bicycle sharing services to high-speed rail service, they concluded that these “sustainable” options would come with an annual price tag of approximately $6.4 billion for Quebec as a whole, or $1,875 per household. In Quebec as in other jurisdictions that have already gone down green roads paved with (feel) good intentions, subsidizing inferior alternatives will result in massive wealth destruction without any meaningful beneficial environmental outcome. The problem, of course, is that energy reality doesn’t accord with the ethical preferences of self-appointed guardians of the greater good who would rather dismiss or heckle their critics as corporate shills than address their arguments. After all, who could be against unspoiled nature, communal bliss and subsidized elitist artistic expressions but people in the pockets of greedy corporations? And who will dare to keep consumers in check for their own good and that of future children, to say nothing of voiceless critters and ecosystems, if not virtuous individuals like themselves (even though they might have to use a fair amount of carbon fuels to get their message across)? But while it was perhaps unavoidable that pampered academic rebels looking for a new cause would eventually settle on telling energy-starved masses to eat little, distant, costly, intermittent, unreliable, and low-density energy cupcakes, what has been especially disheartening for energy realists is how many energy executives have been shamed into paying lip-service (and a fair amount of “sustainability” and “green partnership” consulting fees) to their most virulent detractors. A philosopher by training, Epstein is now an energetic happy intellectual warrior who takes the case for fossil fuels into the most hostile corners, be they academia or the People’s Climate March. Even better, he managed to organize a debate in which he confronted the 350 éminence grise Bill McKibben himself! 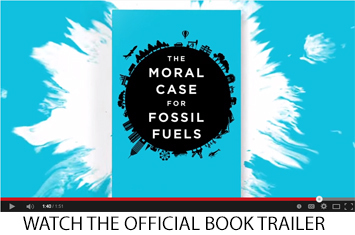 As one expects, The Moral Case for Fossil Fuels debunks most of the nonsense that has now become the common wisdom of the chattering classes on energy issues. Do you want to know why you can’t power light rail systems or simply manufacture smart phones, bicycles or triple glazed windows with wind turbines, solar panels and anaerobic digesters? Or why being operated on in a hospital powered only by “alternatives” might be harmful to your health? Epstein will not only tell you with clarity and gusto, but with a knack for witty one liners that this (arguably less articulate and funny) energy writer hasn’t encountered before. Most importantly, Epstein dares to venture where many energy realists won’t go by explaining at some length that cheap, plentiful and reliable energy, combined with human ingenuity, “gives us the ability to transform the world around us into a place that is far safer from any health hazards (man-made or natural), far safer from any climate change (man-made or natural), and far richer in resources now and in the future” (page 33). 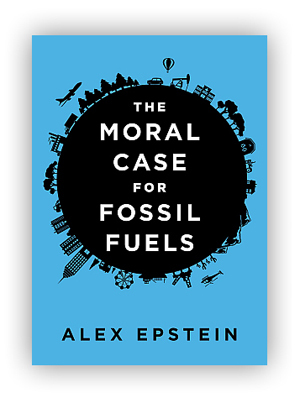 Whatever your reason might be for buying gifts in late December, please consider (on top of your own) offering a copy of The Moral Case for Fossil Fuels to both your loved ones and those sanctimonious green hipsters in your life. It is, as far as I know, the best accessible moral case made on behalf of an issue that is, in the end, a matter of life and death.